I like flying with Southwest. I don’t like the tactics that a research company is using on their behalf. This email arrived in my inbox this evening. 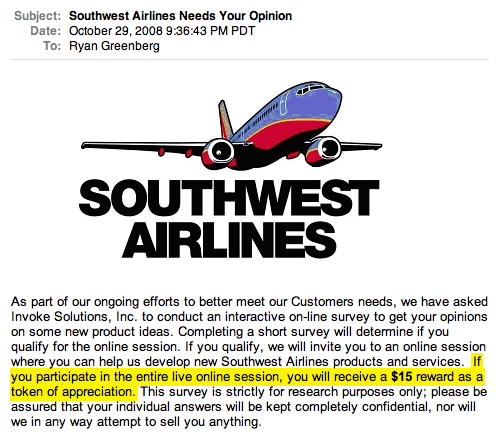 It invites me to take a survey about Southwest and offers a $15 incentive for participation. That seems relatively high, but not inconceivable. I don’t care about the $15. This is simply a dishonest way to solicit information from your customers. This cracked me up man. Sorry to hear you got suckered. That is indeed terrible! OpinionWorld is to blame in this instance, as their screening process should take no more than 2 minutes. This is a common problem with survey takers - you get invited to a survey, spend 20 minutes answering questions, and in the end they tell you you are NOT eligible. This is something the industry needs to have a look at and solve. Otherwise, it’s a waste of peoples’ time and money. Sorry to hear you have been let down by SouthWest and OpinionWorld. We all agree that your theory is crazy, but is it crazy enough?